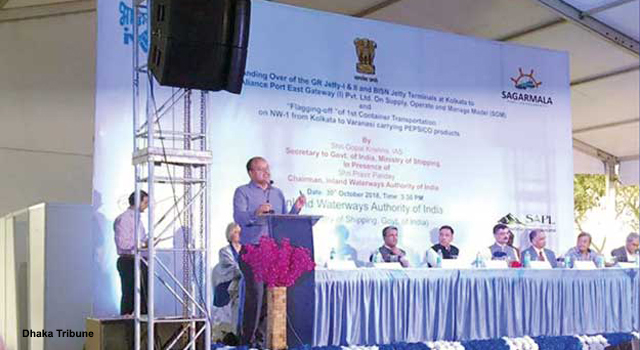 The Inland Waterways Authority of India awarded the contract to operate three river terminals to a Bangladeshi company, the Summit Alliance Port East Gateway (SAPEGIL). SAPEGIL will operate and manage India's river terminals—the Garden Reach Terminal in Kolkata, and the Gaighat and Kalughat Terminals in Patna—under a public-private partnership with India's Inland Waterways Authority. This is the first time a Bangladeshi company was awarded management of terminals in a foreign country. SAPEGIL will put in an investment of $8 million, of which $5 million is for import cargo handling equipment. The project is also expected to tap the potential of Nepal-bound cargo on National Waterways-1, according to a statement by the Press Information Bureau of the Government of India.